For the longest time, I've had Argo Cafe on my "to eat" list. Problem is, it is only open during breakfast and lunch on weekdays. Secondly, for the times I could go, no one wanted to go with me... especially Rich Guy. Yes, his disdain for dives is almost legendary. Leave it up to Vandelay to save the day. Not only is he a willing participant, he suggested we go. So with this opportunity, we made it out to this lunch time favourite on Ontario Street. The place has been around since 1954; but in 2004, Chef Denis Larouche and brother in-law Kirby Wong transformed the menu into something I would call affordable gourmet diner food. Now, this is not necessarily a foreign concept anymore with the newer joints such at The Red Wagon. 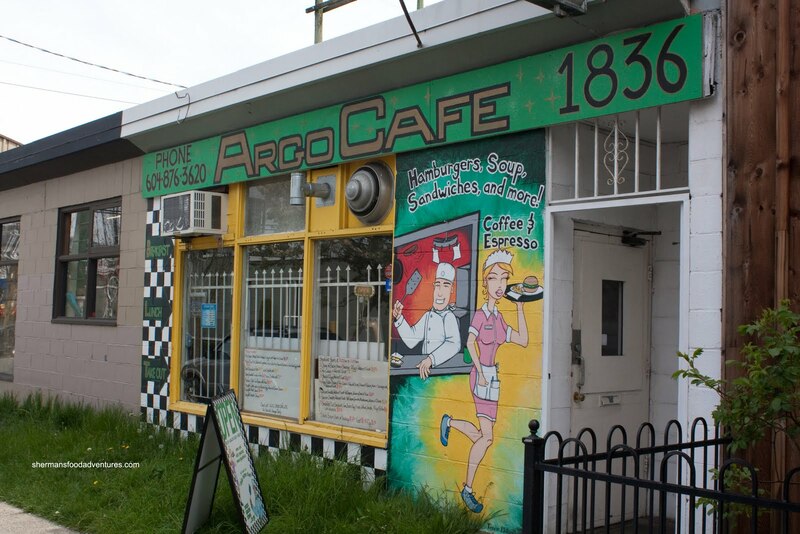 However, Argo Cafe has to be one of the pioneers of the concept in the GVRD. 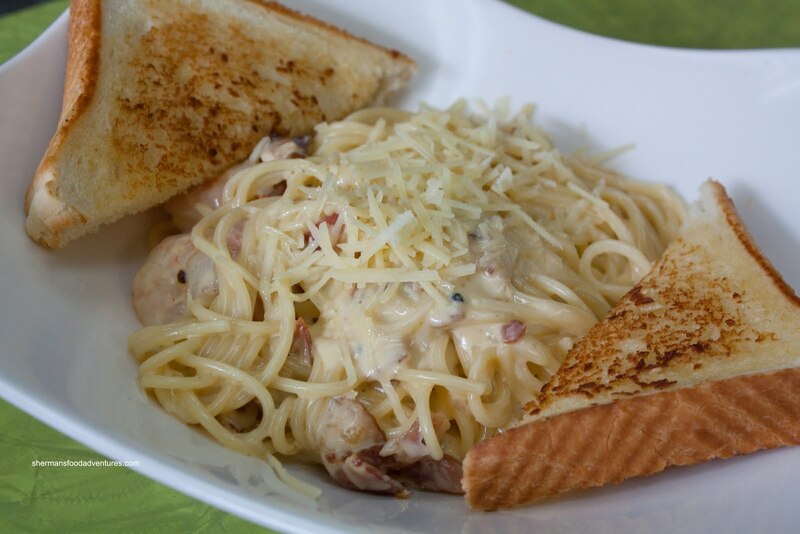 The regular menu is pretty much standard with items such as burgers, pasta and sandwiches; however, the daily menu is where it's at. With almost gourmet items at reasonable prices, this is the main draw here. For myself I went for the Argo Plate. It included a soup, which was Turkey & Beef Borsc ht. 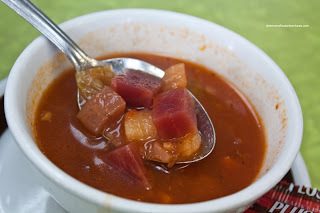 Slightly tart, somewhat sweet and full of beets, this was a pretty typical non-sour cream version of borscht. I thought it was pretty appetizing. I only wished it was served a hotter temperature. 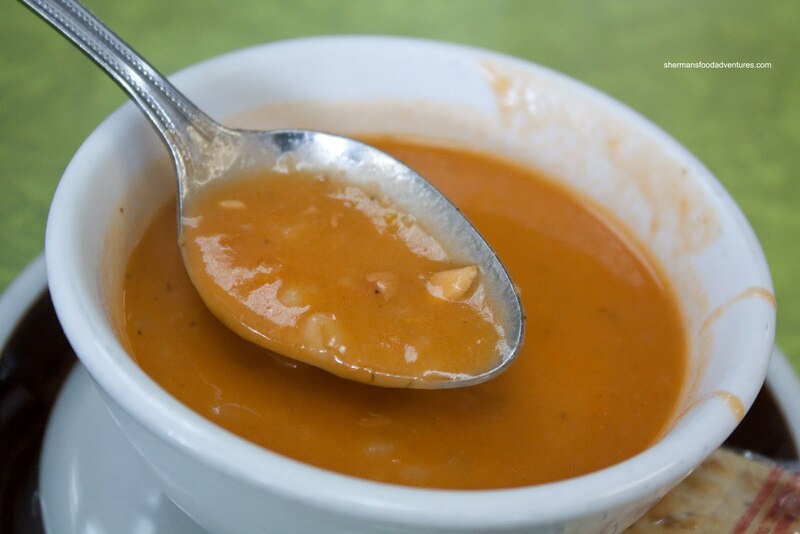 Vandelay ended up with the other soup of the day - Creamy Tomato Dill Barley & Chicken Soup. As advertised, it was creamy. Not really all that tomatoey though. I could barely detect any dill and all of the ingredients were in little bits. Despite all this, I still thought the soup was pretty good. Now back to my Argo Plate. It was basically a mix grilled that acted as a sampler. 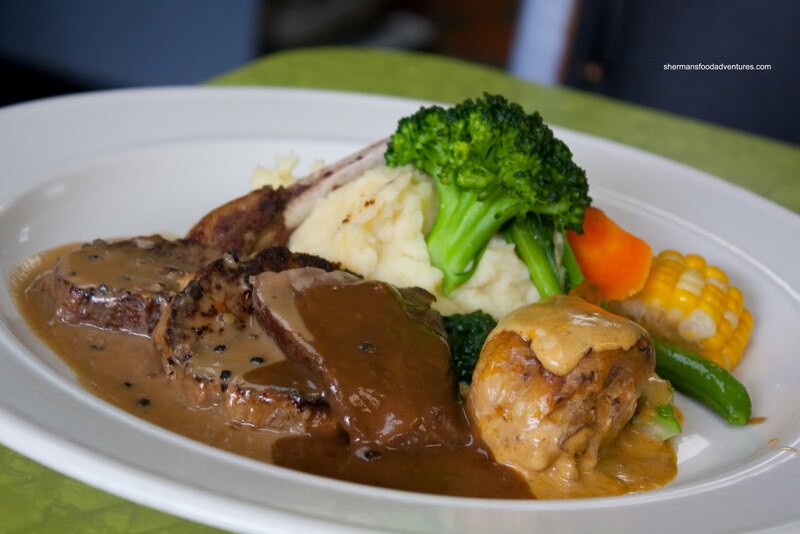 From left to right, we have the lamb chop with peppercorn sauce, meatloaf, beef short rib and coconut curry chicken. Served on the side was mashed potatoes and fresh veggies. The highlight of the dish was surprisingly the chicken. It was moist and the coconut curry was fantastic. The curry was well-balanced with rich coconut milk and mild spice. Very aromatic and tasty. I also liked the short rib, it was fork tender and the accompanying gravy had a nice richness to it. I liked the lamb chop; but it could've stood to be more rare. As for the meatloaf, I found it crumbly and kinda strange. As you can see, the veggies were vibrant and not overcooked. Vandelay went for the Spaghetti Carbonara. It was very creamy, thick and smooth. No egg clumps anywhere. Also, there was just the right amount of baconess. Moreover, the noodles were not overcooked (not quite al dente either). This was a solid carbonara. 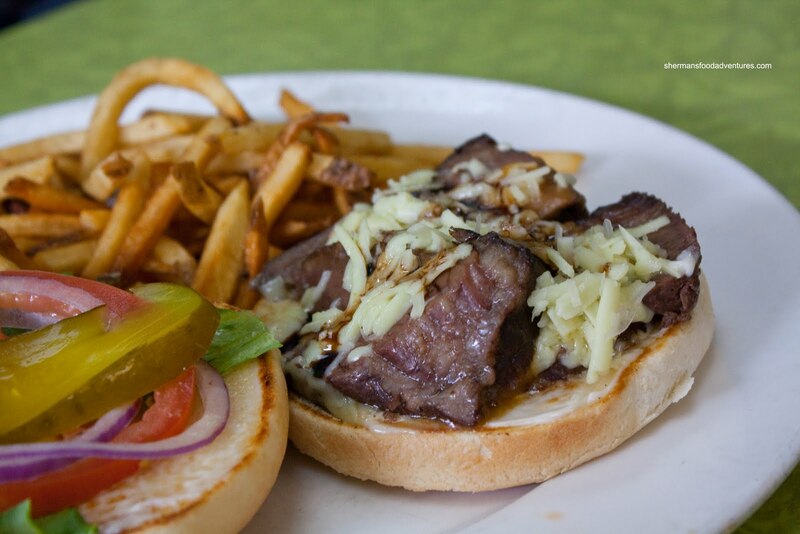 Lastly, we shared a Boneless Beef Short Rib Sandwich topped with wasabi, cheddar cheese and balsamic reduction. Just like the short rib in the Argo plate, the meat was super moist and tender. I thought the "horseradish-like" effect of the wasabi added a unique kick to the sandwich. In a strange way, it complimented the tart/sweetness of the balsamic reduction. This cut the heaviness of the short rib. I would've preferred if they used something more creative than a hamburger bun though. Although the food didn't necessarily blow us away, it was thoroughly solid at a reasonable price. Definitely a little gem in a hidden location. It won't be for long though. It'll be featured on the Food Network in the fall. Maybe I need to give this place another shot. When I went, I found the prices higher than my usual dive places, so I changed my mind. I guess, if the food quality is there, then it's worth the extra bucks. @holly Please try it again. I thought it was not bad. Not outstanding, but much better than one would expect from such a place.